Your privacy is important to me. To better protect your privacy, I provide this notice explaining my online information practices and the choices you can make about the way your information is collected and used. The use of DART cookies enables companies to serve adverts to visitors that are based on their visits to this website as well as other sites on the internet. When visiting ThatMutt.com, the IP address used to access the site will be logged along with the dates and times of access. This information is purely used to analyze trends, administer the site, track users’ movement and gather broad demographic information for internal use. Most importantly, any recorded IP addresses are not linked to personally identifiable information. I have included links on this site for your use and reference. Some of these links are advertisements or affiliate links and That Mutt earns a commission on purchases anyone makes when clicking on one of our affiliate links. I am not responsible for the privacy policies on these websites. You should be aware that the privacy policies of these sites may differ from my own. All of the tips, recommendations and information That Mutt are intended for you to use at your own risk. 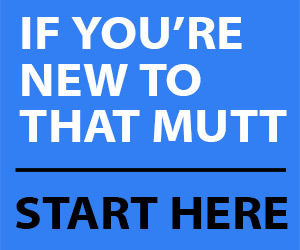 On That Mutt, you may subscribe to our newsletter, which may be used for advertising purposes. All newsletters sent may contain tracking pixels. The pixel is embedded in emails and allows an analysis of the success of online marketing campaigns. Because of these tracking pixels, we may see if and when you open an email and which links within the email you click. Also, this allows That Mutt to adapt the content of future newsletters to the interests of the users. This behavior will not be passed on to third parties.